In another stellar year for children’s books (see my Best Children’s Books Spring 2017), these are the books that would be worthy additions to any child’s bookshelf. Award-winning Biddulph is back with this beautiful rhyming story about imaginary friends and blaming others for our own wrong-doings. It’s a visual treat and a heart-breaking story. The new Children’s Laureate returns with her best Charlie and Lola book yet. Lola wants a dog and contemplates all the attributes she’d like it to have, before taking a trip to the pet shop for an hilarious ending. Not just a book but a publishing phenomenon, the deservedly bestselling Goodnight Stories for Rebel Girls profiles one hundred influential women through the ages, each with a striking full-page portrait by different illustrators. There should be a copy in every child’s Christmas stocking. For younger readers, Frances Lincoln continue their strikingly illustrated Little People Big Dreams series about important women in history with individual titles on Marie Curie, Audrey Hepburn, Emmeline Pankhurst, Rosa Parks and Agatha Christie. Stunningly illustrated, this beautiful story about a worm dreaming of having more space and a bird waiting above ground would be fitting on any bookshelf – adults and childrens. Peter Bentley’s spirited retelling of Dodie Smith’s classic is the perfect picture book for younger children. Lenton’s illustrations are bursting with humour, character and playfulness. Woollvin is fast making a name for herself with her boldly illustrated feminist retellings of fairy tales. Here, Rapunzel tricks the witch, befriends a horse and wins her freedom without a man in sight. Brilliantly empowering. Following hot on the heels of Animalium, Historium and Botanicum comes this luscious, lavishly illustrated and information-rich compendium of dinosaurs. Wormell’s illustrations are rich in detail, bringing the Mesozoic period to life better than any children’s book before. A must-have for dino-lovers. For slightly younger readers, Atlas of Dinosaur Adventures takes a more playful approach, surveying dinos by the continent on which they lived, with fun illustrations and packed with information. In lyrical prose and tender illustrations, The Night Box tells the story of the magic of nature at night, making darkness seem not just unthreatening but full of wonder. The perfect bedtime read. A gorgeous tale about a boy missing his mum when she goes away for the night. Funny, poignant and a great springboard for children to discuss their feelings. The story of the search for life on Mars, told from the perspective of the NASA probe Curiosity. Brilliantly brings space exploration to life as well as rich in information. From Ada Lovelace to Helen Sharman, Jackson celebrates women who have contributed to space exploration. With brilliantly accessible one-page biographies accompanied by full page illustrations, it should – alongside Goodnight Stories for Rebel Girls – be in every school, library and home. For younger children, award-winning Jeffers delivers this gorgeous book posing big philosophical questions about life and the universe perfectly packaged for little people, all in Jeffers’ inimitable playful style. 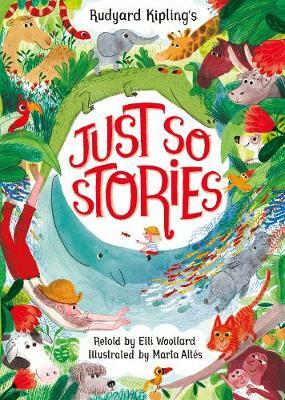 A bad mood travels from one person to the next (depending on the whereabouts of the stick) in this funny, thoughtful and clever story. In wonderful rhyming verse, Woollard has adapted Kipling’s classic tales for a new generation, accompanied by Altes’ gloriously playful and characterful illustrations. Fantastically information-rich book about migrating animals: the distances animals travel and the reasons why make for awe-inspiring reading. All animal-loving children need to get their hands on these true stories of animal rescues. Each book is packed with ‘fact files’, as well as the story of one individual’s rescue. Also in the series are books about a tiger, leopard, elephant, dolphin, chimp and bear. Teckentrup’s work is always warm and thoughtful and here she takes a simple idea – illustrating and describing different eggs from different species – and turns it into something beautiful and fascinating. There are many puzzle books on the market, but this stands out for inventiveness and visual eclecticism. A wonder of a book: planetarium, musical instrument, infinite calendar, sound projector, message decoder and drawing generator. It will have kids entertained for hours. Exploring the diversity of life on earth and filled with wondrous facts – as well as endearing illustrations from Scobie – it will have kids treasuring their planet.